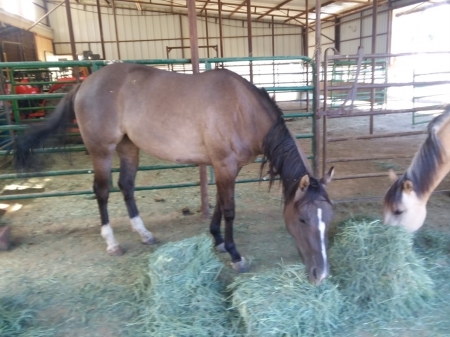 She is a beautiful line back grullo three year old with long main and tail. 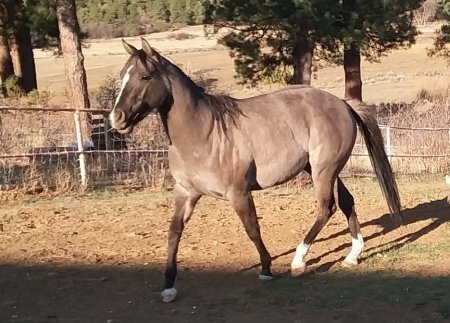 She is registered appaloosa because the Quarter Horse Association will only register 100% quarter horses and she is only 3/4 quarter horse. She was imprinted at birth and is a fast learner. She learns by watching. Her feet were only picked up 4 times and she watched her mom get her feet trimmed before our farrier worked on her. That's all it took to make trimming her feet easy. Her sire and grand sire DJ Bold Letters and A Dandy Rawhide are listed in the All Breed Database and are know for heading and heeling. A Dandy Rawhide has his Open Superior Dally Heading and Open Superior Dally Heeling. He won the Rocky Mountain Summer Slide Futurity Limited Open in Denver and Qualified for the World Show and Congress. She is showing all the intelligence and athleticism to do the same. She has had ground training and is going to our trainers for the next phase of her training this spring.